The Saxon name of the month has a pastoral charm about it which is as delightful as the gorgeous imagery of the great poet. “The pleasant month of May they termed by the name of Trimilki, because in that month they began to milk their kine three times in the day.” The illumination of the Calendar carries us into the pleasant fields, where the sheep are nibbling the thymy grass, and the old shepherd, seated upon a bank, is looking upon the lamb which the labourer bears in his arms. The shepherd describes his duty in the Colloquy of Alfric: “In the first part of the morning I drive my sheep to their pasture, and stand over them in heat and in cold with dogs, lest the wolves destroy them. I lead them back to their folds, and milk them twice a day, and I move their folds, and make cheese and butter; and I am faithful to my lord.” The garments of the Anglo-Saxons, both male and female, were linen as well as woollen; but we can easily judge that in a country whose population was surrounded by vast forests and dreary marshes, wool, the warmer material of clothing, would be of the first importance. The fleece which the shepherd brought home in the pleasant summer season was duly spun throughout the winter, by the females of every family, whatever might be their rank. 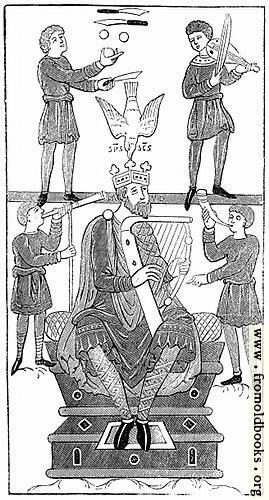 King Edward the Elder commanded that his daughters should be instructed in the use of the distaff. Alfred, in his will, called the female part of his family the spindle side. At this day, true to their ancient usefulness (the form of which, we hope not the substance, has passed away), unmarried ladies are called spinsters. But the Anglo-Saxon ladies attained a high degree of skill in the ornamental work belonging to clothing. The Norman historians record their excellence with the needle, and their skill in embroidery. Minute descriptions of dress are not amongst the most amusing of reading, although they are highly valuable to the systematic chronicler of manners. It maybe sufficient for us to point attention, first to the cloaks, the plain and embroidered tunics, and the shoes of the males (Fig. 285, and incidentally in other Figures). These were the loose and flowing garments of the superior classes, a costume certainly of great beauty. The close tunic of the labourers (Fig. 255) is distinguished by the same fitness for the rank and occupation of the wearers. The practice of bandaging or cross-gartering the hose is indicated in many Anglo-Saxon drawings (Figs. 284, 288). 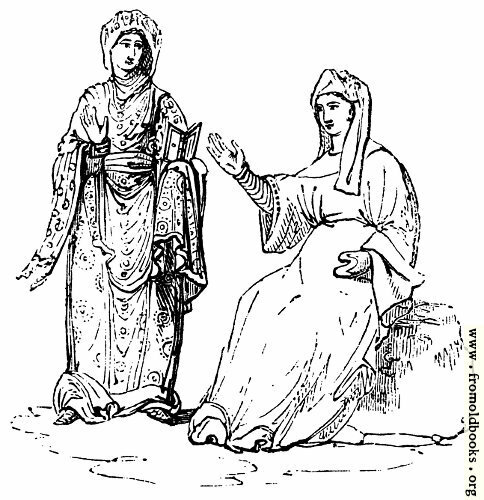 Secondly, the ladies wore a long and ample garment with loose sleeves (the gunna, whence our gown), over a closer-fitting one, which had tight sleeves reaching to the wrist; over these a mantle was worn by the superior classes, and a sort of hood or veil upon the head (Figs. 286, 287). 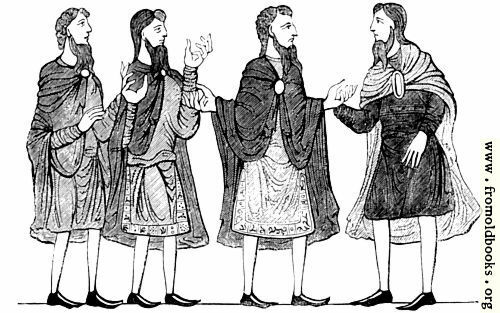 Those who desire further information upon the subject of the Anglo-Saxon costume may consult Mr. Blanche’s valuable little work upon ‘British Costume,’ or the ‘Pictorial History of England,’ Book II. Chap. VI.